Getting Things Done – A concept by David Allen. PersonalBrain 5 is out. A new year is out and I haven’t posted anything yet. Now seems like a great time for a new, long, rambling review of PersonalBrain followed up by a bit of philosophizing. The coolest changes in PersonalBrain (okay maybe not the coolest) are the changes I submitted myself. A few months ago I created some open source icons and sent in some suggestions as to how PersonalBrain could look more natural in OS X. TheBrain (the company that makes PersonalBrain) changed PersonalBrain to use icons very similar to the ones I created. Also gone is the giant, unnecessary “PERSONALBRAIN 5 PRO EDITION” button that previously was at the top right corner. I also created a new background for PersonalBrain, but it wasn’t included. If you’re interested in downloading the background, you can get it here. The full list of new features in PersonalBrain 5 is located here thebrain.com [pdf]. I won’t go through the entire list, but I will mention a few highlights. The biggest new feature is the outline view – which offers another way of visualizing your data. This feature is probably the most useful for newer users. When I first started using PB it took some time to adjust to the mindset of having parents at the top, siblings to the left, “other relationships” (I’m not sure what the official terminology is) off to the right etc. 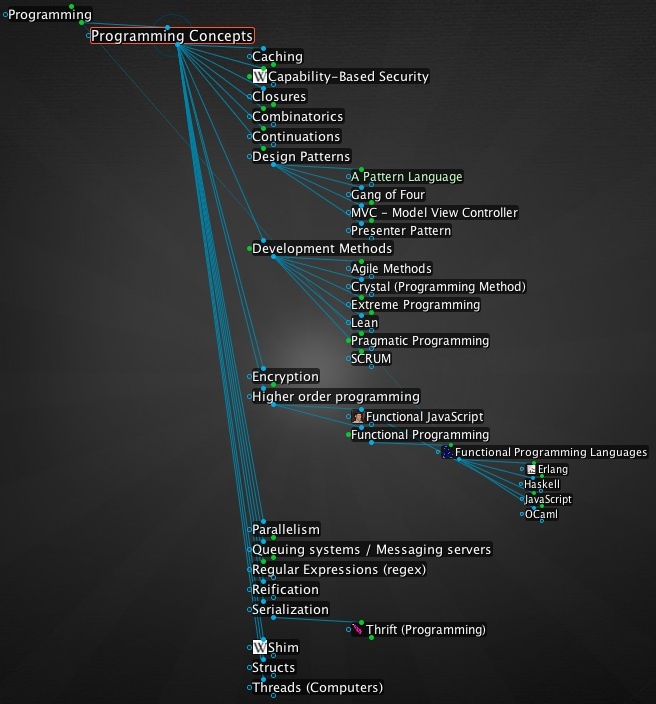 The new outline view makes it very apparent what the relationships are between each node. Another great new feature is the ability to save “expanded views.” It replaces my previous method of taking a ‘snapshot’ of my Brain which was simply to take a screen capture. The new presentation view is useful as well. I have never given a public presentation usingPersonalBrain , but given the opportunity, I’d love to try this new mode out. Tagging was introduced in PersonalBrain 5 and while I haven’t used it much, I think it has some good potential. Also new are some nice Mac only features like iCal and Spotlight integration which are definitely welcome. On the whole, PersonalBrain 5 is a solid release. Most of the changes are evolutionary rather than revolutionary, but there are enough of them to make it a significant improvement. I’m happy with PersonalBrain as it is, but since I have a soapbox, here are a few things I’d love to see in the future. iPhone app. This is surely the hardest, and possibly the least likely item on my wishlist. If, however, there was an iPhone app for PersonalBrain that could sync with the desktop version it would be amazing. Better keyboard navigation. Currently you can navigate PB almost entirely by keyboard, but doing so involves using lots of “F” keys (F7 creates a parent thought for example). Keyboard shortcuts would be much better if they the common conventions of using the command key on OS X or the control key for Windows. Even better would be to allow user-customizable keyboard shortcuts. Sync. Lately I’ve had a big need to use PersonalBrain on two different machines. Dropbox has made this fairly simple. I put my whole PersonalBrain file in Dropbox and it syncs automatically to any computer that I’ve installed Dropbox on. There is one potential pitfall though–if I forget to close PB on one computer then open it on another it causes some, non-fatal, errors. I leave screen sharing (VNC) enabled on my home computer so if I leave PersonalBrain open I can login and close it on the home machine, but sometimes if I’ve closed the laptop at home I can’t do that and it’s problematic… but I digress.PersonalBrain makers: an “official” way of syncing PersonalBrain between machines has been long-hinted at, how’s that coming along? Even more native look improvements. As mentioned before, PB has come a long way on OS X, however there are still some major areas for improvement, most having to do with the bottom half of the screen. PB could take a great leap forward by cleaning up the interface down there, even without adding any new functionality. If you’re a curious person, if you want to know something about everything, if you’re a generalist, an aspiring polymath, a reader, a researcher, you can’t beat PersonalBrain for organizing all the stuff you come across. Nothing comes close. Let me preface the following thoughts by saying that I am strongly biased towards the way I use PersonalBrain. Some of these thoughts are controversial for those who use PB in other ways, which is fine, some controversy is welcome. I think that the list on thebrain.com gets most of the top uses for PersonalBrain wrong. 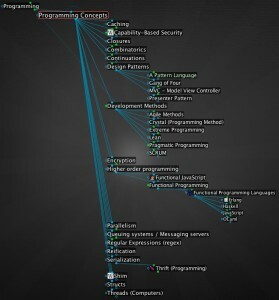 Most of the items on the list are things that could be done in PersonalBrain but could better done with other software. Before I dive into specifics, let me reiterate, PersonalBrain is quite possibly my favorite piece of software and I use it every day. My criticism is meant to be constructive. 1. Visual bookmark manager. I think this is better done by something like delicious.com and the del.icio.us extension and/or native browser bookmarks. I have bookmarks in PersonalBrain, quite a few actually, but I prefer to keep the majority of my bookmarks in the browser where they can be tightly integrated and easily accessed as I’m browsing. 2. File and everything in your life manager. In OS X I use the Finder and I use Windows Explorer in Windows. These programs are built with the specific purpose of managing files and they do it well. I have hundreds of file attachments in my PB but I still can’t imagine trying to use it as a general purpose file manager. As far as the “everything in your life manager” part goes, I’m just going to ignore because it’s not specific enough to be meaningful. 3. Capturing expertise and special interests. This is the best item in the list. It ends with this gem: “PersonalBrain becomes your ultimate reference.” Indeed. I think that (or something very similar) should be right on the front page of the site. Make this one number one in the list, make it bold, elaborate on it for a few more sentences and make the font size 3 points bigger. 4. Competitive Intelligence and Product Development. I like this one too. I think it could be a great addition to any PersonalBrain though I wouldn’t create a separate brain just for this. 5. Research and Analysis. Another good one, though why the heavy business focus? Because that’s where the money is? Fair enough, but it minimizes a whole world of other research. 6. Event planning. I think this would be done better in iCal or Outlook or Entourage or even in a mind map or an outline. PersonalBrain just doesn’t seem like a natural tool for this. 7. Brainstorming and mind mapping. I much, much prefer Freemind or MindManager for this. If it’s a finite brainstorming session or a mindmap related to some specific, ephemeral project then I’d prefer to capture it in mindmapping software where I can use it, then be done with it (again, perhaps attaching it to a PB node when I’m done.) 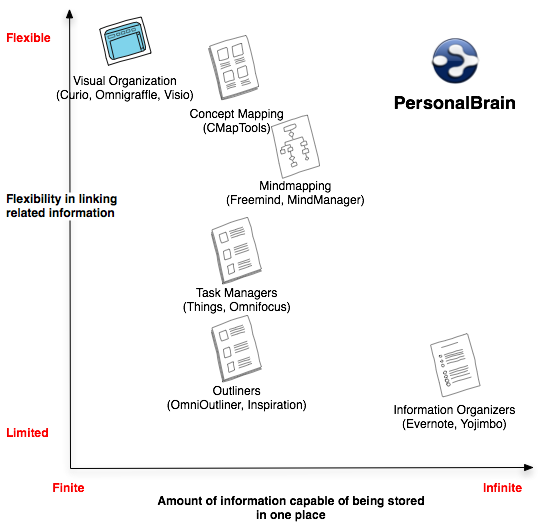 I think suggesting PersonalBrain for general mind mapping is confusing because it lumps it in with specialized mind mapping software that all have specific features thatPersonalBrain can’t (and shouldn’t try to) compete with. 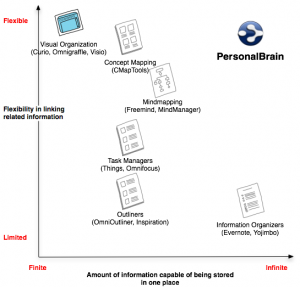 Another way of stating this is that PersonalBrain is a great mind mapper, but not a great Mind Mapper. 8,9,10,11,12. I’m not going to cover each one specifically because the general problem with each them is the same: you could find specialized software that would better suit your needs. It isn’t that you can’t do any of these things in PersonalBrain, it’s that PB is not the “best tool for the job” and presenting it as such only serves to take away from the real uses of PersonalBrain. My PersonalBrain has over 5000 thoughts. 5179 as of this moment to be specific. I have grown to “trust the system.” If you’ve read GTD you’ll understand the significance of that statement. If I was sent to a deserted island and could only take one piece of software, it’d be PersonalBrain. I have enough reading material in the attachments to keep me busy for the next 10 years. There are enough areas to left to explore to last me a lifetime, which is what I plan on doing–spending a little time every day for the rest of my life adding to both of my brains, myPersonalBrain and the one on top of my shoulders. I have much more I could say about my uses for PersonalBrain, and at some point I’ll create another video showing how I use it, but for now, thanks for reading, feel free to comment and disagree (or agree) as much as you’d like. I recently discovered Personal Brain and I’m taken with it. It took me a couple hours of experimentation and more importantly, playing with Jerry Michalski’s brain to get used to it and to realize how powerful it is. For those of you who ‘get’ and use GTD, I’ll say that this gave me the same feeling I got when I started really using GTD-it’s a trusted system for all the information I want to make sure I remember. It’s more than that though–it’s a way to find patterns in knowledge and thing I’m learning, a way to create patterns, to store about anything… it’s fun, addictive (after a little over a week I have well over 1000 thoughts). In the video I call Personal Brain “new”–really it’s only new for me, it’s been around for about 10 years. Personal Brain is Java which means it’s available on Mac, Linux and Windows. It also means it’s not as Mac-like as most of my other favorite software, but it’s really not bad. Personal Brain comes in 3 versions – free, core and pro. The core and pro versions are expensive. Fortunately the free version is very adequate. There’s also an enterprise version (BrainEKP) which is networked and web-based. This is the last in a series of 10 articles that give suggestions meant to improve the over-all quality of your life. You’re not confident you can do it well, in which case you need to break it down to steps small enough to accomplish and start moving. If you start breaking it down only to find it’s completely out of your capacity then just let it go completely. You can only do what you can do. It’s not worth doing. If whatever it is doesn’t provide some innate satisfaction it may just not be worth doing. This isn’t a plug for hedonism, but the fact is that when you’re doing what’s right, generally it feels good at least at some level both while you’re doing it and after it’s done. (e.g. having the knowledge that it’s the best thing to do in the long run). It’s a task you find menial, repetitive, boring etc. Washing the dishes, mowing the lawn, cleaning in general, doing the budget etc. Many times these tasks can be enhanced by doing other things at the same time. Listen to an audiobook while you wash the dishes. Meditate while you mow the lawn (who says you have to be sitting with your legs crossed!) If you’ve got problems doing your budget it may be that you need to re-analyize your finances and get them in order. For these kinds of tasks it comes down to distracting yourself from the menial, automating the repetitive if possible or searching for the true root of the problem and fixing it.Life does not always have to be exciting and stimulating but there’s hardly anything worth doing that can’t be enjoyed at least to a degree. Once you’ve eliminated dread then it’s probable that a large portion of the stress will be gone from your life. Of course there is no way to simplify every cause of stress down to one small list but you can at least eliminate most self-imposed stress and this includes stress imposed by trying to do things to improve your life. That’s it! Hopefully you’ve been able to glean a bit of useful information from the articles over the last ten days. If you have (even if you haven’t) I’d love to hear about it in the comments! As I stated in the beginning of the series I really believe that if the things I’ve suggested in these articles are applied to daily life they will really improve the quality of your life and provide you with meaningful experiences and memories. This is the ninth in a series of 10 articles that give suggestions meant to improve the over-all quality of your life. 9. Stop broken thoughts. Broken thoughts are those subtle patterns that aren’t quite big enough to fall into the bad habits category. This means that despite their harmful effect they often escape under the radar. Broken thoughts often take the form of justifications. Examples? I’m just going to leave my dish here by the sink, I’ll wash it later (when you know your spouse will end up washing it). I’m bookmarking this article to read later (how often do you ever go back and read old bookmarked articles?). I’ll hang my shirt up later (when you know it will be there for a week before you touch it). At first it will be hard to recognize broken thoughts since they are so ingrained into our world views–they are things we do every day and we’re so used to doing them that we don’t even recognize that they are harmful to ourselves or those around us. If you make an effort to find them soon you’ll notice broken thoughts everywhere which might be negative if weren’t so easy to fix! Often broken thoughts are the result of procrastination–anytime you hear the word later pronounced by your inner-voice let it be a trigger that alerts you to the possibility of a broken thought. The other big one is offsetting responsibility to someone else. If you’re leaving something because someone else (your wife/husband/mom/dad/co-worker) will pick up your slack it’s a broken thought–improve their life and yours and take care of it yourself. The great thing about these broken thoughts is that fixing them generally takes a day or two–they’re not like bad habits that can take years to cure. It’s such a good feeling to see a noticeable improvement so quickly. It keeps you on your toes and keeps your actions in sync with your values. This is the eight in a series of 10 articles that give suggestions meant to improve the over-all quality of your life. 8. Recognize what makes you happy. Reflect on the parts of your day that bring you real satisfaction. Everyone is working towards something, but what makes you happy now? Rate your overall satisfaction with your quality of life for each day on a scale of 1 to 10, focus on the things that happened that pushed the number higher rather than what made it lower. Try to incorporate more of what made you happy yesterday into today. I think that too many people pass through the happiest times in their lives without recognizing them as such. Live in the moment–savor the things that bring you true satisfaction. If you’re in school focus on the opportunity you have to spend every day learning and improving yourself rather than on how hard it is to have so much homework and so little free time. If you’re starting your career relish the opportunity you have to shape your path rather than focusing on how good it will be once you have a raise or a better position. Taking time each day to rate it will help you realize either that you’re already living a pretty happy life or it will help you recognize the specific things you can do to improve your life by incorporating more of what brings you real and immediate satisfaction into each day. Take small steps that will lead towards longer term improvements. Remember that serving others and making the lives of those around you better directly contributes to your own quality of life. This is the seventh in a series of 10 articles that give suggestions meant to improve the over-all quality of your life. Outside is where ‘real’ stuff happens. Read Lonesome Dove (read it outside of course) and you’ll know what I mean. If you paint, do it en plein air. If you write try writing on real paper outside. While you’re out there, count the bugs. Become a bird-watcher, catalog the plants you see. Learn the constellations. Everywhere you look outside you find things the the combined human knowledge can’t explain–so many mysteries, so much to discover. This is the sixth in a series of 10 articles that give suggestions meant to improve the over-all quality of your life. 6. Spend time with a child. If you have one, consider yourself lucky, if you don’t, I bet you have friends who would be happy to let you borrow theirs for a few minutes (or hours). 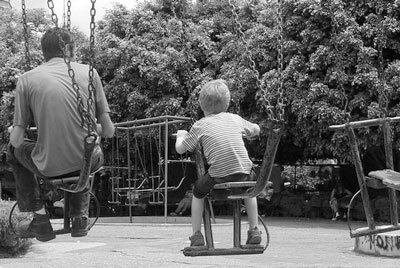 It doesn’t matter what age they are, children see the world entirely different. Look at it from their eyes. Be their hero. Appreciate what they appreciate. Enjoy the simple things again. You’ll love it and they’ll love you for it. Children will help you appreciate the simple things in life. They’ll keep you on your toes with questions that you can’t even begin to answer. They’ll amaze you with the seemingly endless levels of energy they have. After spending time with a child you’ll also realize just how much of an influence you are over their moldable minds–they almost worship you. It is a humbling experience. This is the fifth in a series of 10 articles that give suggestions meant to improve the over-all quality of your life. 5. Debate something. If you think you know about something, nothing will prove it like arguing it with someone who’s smarter or more informed than you. Find a friend you can debate with who has ideas that are different from your and who won’t be offended by debating them–this is easier said than done, but it can provide you with some of the best mental stimulation possible. It’s healthy to raise your voice every once in awhile in a heated discussion. Debating is a way to introduce controlled tension into your life which is good for you. Arguing will spur you on to learning, it will challenge your beliefs and forcing you educate yourself. Everyone is part of groups that dictate at least to some degree how we think. This could be your political affiliations, religion, university, career etc. To a degree it is okay to accept what these trusted sources tell you without feeling the need to prove every fact, but finding it out for yourself through research and debate will either serve to strengthen your affiliation with the group through gaining your own knowledge or help you gain the courage to distance yourself from groups you would rather not be associated with. Be passionate. Seek truth. Be willing to accept being wrong to arrive at the greater goal of knowing the truth. If you don’t have anyone to debate with, challenge yourself mentally. Always think a step deeper. Know something? Are you sure? What caused it? What comes after that? How would someone who “knows” something different dispute what you know? This is the fourth in a series of 10 articles that give suggestions meant to improve the over-all quality of your life. 4. Learn something new. Pick a topic, preferably something you know nothing about and learn something about it. A good source of inspiration for this can be the newspaper or Wikipedia. It helps to retain it if you have time to make a note of what you learned or explain it to someone else, but even if you don’t get the chance to do that, your brain will thank you for the new patterns you introduce as you learn something new every day. Once you’ve got new ideas rolling around in your head you will be surprised at the patterns that start forming. Connections will be made from seeming unrelated topics–that’s the stuff from which innovation comes. If you’re not doing it already, learn something new every day. As you’re searching for books, don’t forget to turn to the classics as well. Have you read Don Quixote? War and Peace? 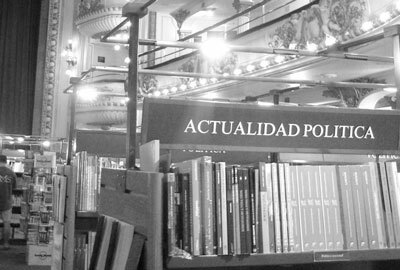 These are books that will change the way you think forever. This is the third in a series of 10 articles that give suggestions meant to improve the over-all quality of your life. 3. Make it a point to do something bold every day. Step out of your comfort zone, leave the routine even if for only a second. This might mean talking to someone that you generally wouldn’t talk to or starting a project that you feel intimidated by. There is no need to plan it in advance–though that might help at times, usually though you’ll find a point during the day when ‘two paths diverge in the woods’ and you have the change to take the one less travelled by. Take it. When there is something that we aren’t accustomed to doing we naturally set up mental barriers against it to protect ourselves from the thought of doing it. It takes a bold move to act and break those barriers. Doing something bold every day doesn’t mean changing the world, it just means making a conscious effort to do something that will get your adrenalin pumping for a second or to by changing your routine. Taking calculated risks is healthy. If you want to track your progress (which is always good) write down the bold thing you did in your journal. It will be fun to look back after time and see what you considered bold a week, month or year ago.